My favorite birthday cake recipe? Funfetti Cheesecake, of course! Cute, creamy, and colorful – these mini cheeseakes with vanilla wafers for crusts are an easy dessert recipe you are going to love! 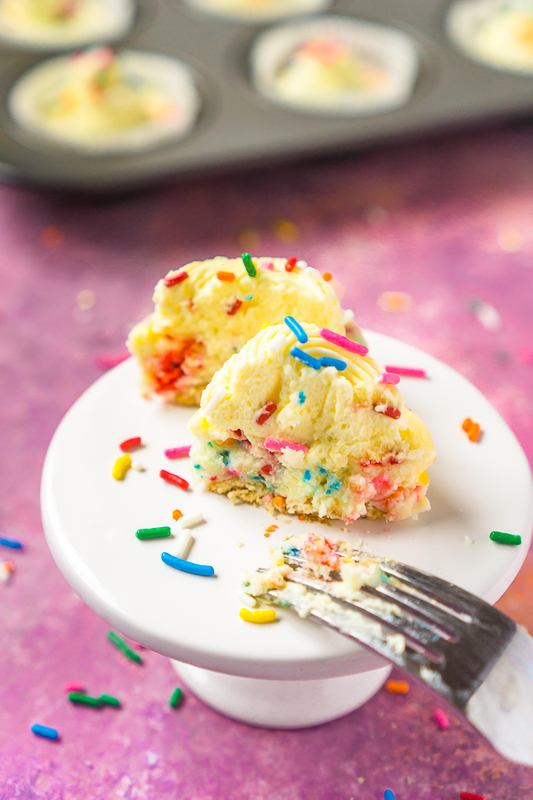 Time to Celebrate with these Colorful Mini Funfetti Cheesecakes! I’ve always been pretty vocal about the fact that I am not a cake person! My family would all usually have a basic yellow or chocolate cake mix birthday cake with frosting for their celebrations every year. If there is something I don’t like more than cake, it’s buttercream frosting. 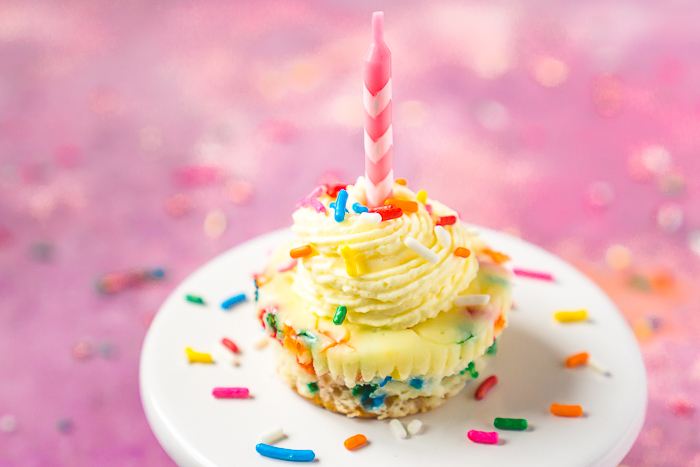 So needless to say, I have always been a bit picky about my birthday dessert but these Mini Funfetti Cheesecakes definitely make the list! Cheesecake is my all time favorite dessert, and mini cheesecake recipes are even better because of how easy they are to make and how little time they take to prep and cook. Plus, I’m always a fan of individual desserts for a party menu because they are easy to grab and eat while standing around. No fancy serving required! With birthday week upon us, I brought a batch of these cuties to a friend gathering! I used vanilla wafers for my cheesecake crust, which is my favorite quick tip for making mini cheesecakes. That or a thin oreo if you are looking for a chocolate crust! I decided to whip up a batch of no wilt whipped topping as a garnish along with some extra sprinkles, too! I love how they turned out! I even saved a couple for us still at home, so I will be adding a candle to one on Thursday night for Bryan’s birthday dinner! Now, these don’t take a lot of time to make from start to finish – around 15 minutes of prep work and 15 minutes to bake in the oven. However, if you need a birthday dessert that’s even faster, you will not want to miss my Funfetti Cheesecake Dip served with graham crackers, animal crackers or pretzels! It’s the most addicting recipe I make for my sweet tooth. No joke! Bulk Rainbow Sprinkles or specialty sprinkles from my favorite shop! YOU MIGHT ALSO ENJOY THESE OTHER MINI DESSERT RECIPES! Enough Talking! Let’s Make Some Birthday Cheesecake! 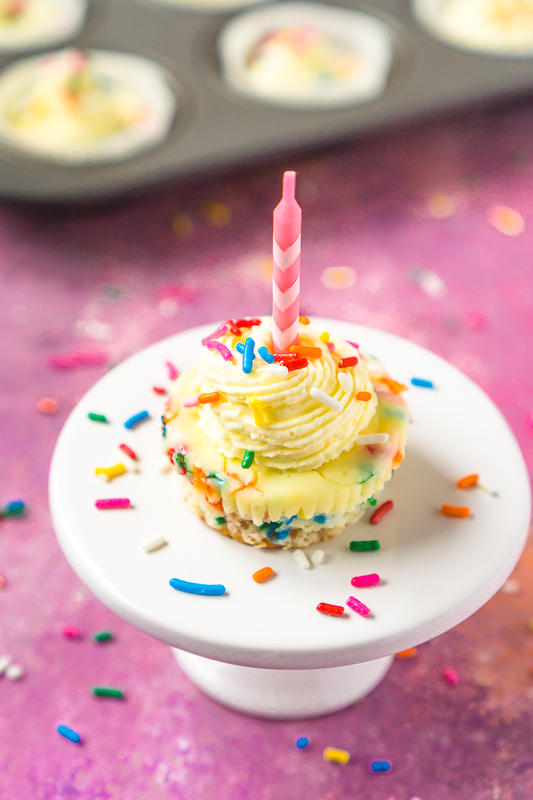 Mini Funfetti Cheesecakes are the perfect birthday party dessert recipe!! A sprinkle filled birthday cake cheesecake filling on top of an easy vanilla wafer crust! Add sour cream, sugar, egg, and lemon juice to the cream cheese and beat until smooth. Then fold in your sprinkles. Scoop around 2 tablespoons of cheesecake filling onto each vanilla wafer. Add heavy cream, confectioners' sugar, vanilla pudding mix, and vanilla extract to a stand mixer fitted with a whisk attachment, and whip until light and fluffy (about 2 minutes). Scrape down the sides as needed.